I have been postponing writing about this recital in the spirit of the Wordsworth Preface toLyrical Ballads concerning the definition of Romantic poetry as being 'emotion recollected in tranquility'. I always anticipate a recital by this master musician for weeks and it always takes me some time to come to terms with his reinvention or rather recreation of everything he touches. 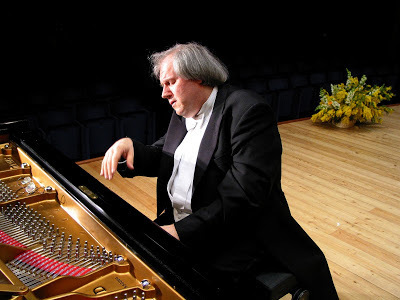 Sokolov chose to play the Schubert Vier Impromptus Op. 90 D 899, the rarely performed Drei Klavierstucke D 946 and the Beethoven Sonata in B Major op. 106 better known as the Grosse Sonate fur das Hammerklavier. Schubert wrote all of these serious works close to his frightful death from tertiary syphilis in 1828. They were also conceived at much the same time as that great outpouring of profound and hectic sorrow contained in the cycle of Lieder known as Der Winterreise. The connotations of the term 'Impromptu' indicates something lightweight but these works are far from this.